Only in case of CTP And ADDITIONAL category student practical subject fee will be applicable. Latest News (25.10.2018) - Haryana Open Re-appear Result has been declared now. Latest News on 25th August 2018 - HOS Open Sept 2018 Admit Card Released Now. 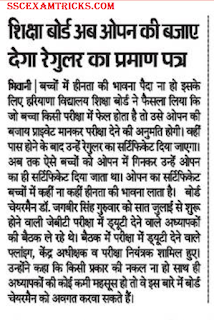 The good news is that Haryana Open Admit Card for September Exam has been released now. Latest news on 17th August 2018 - HOS Open 10th 12th Re-appear / Compartment Admit Card 2018 will be released very shortly (within 2-3 days) - The latest update is that Board of School Education Haryana Bhiwani in going to release online admit card for theory papers to secondary and senior secondary open school all categories for September exam 2018 which has been scheduled to be started from 5th September 2018. The theory paper will be conducted from 2 p.m. to 5 p. m. in the evening. HOS compartment Sept exam will be ended on 28 September 2018. HOS Re-appear Admit card will be available within two to three days on official website www.bseh.org.in. Important note - The candidates are advised to read the venue of exam about 20 minutes before the commencement of exam. No electronic item will be permitted to enter into the examination hall. Candidate must bring their own log book, trigonometry table, Slencils for map and colour pencil (for science subject paper only) in the examination hall. Keep in touch with us to get latest update on HOS Re-appear Admit Card 2018. On 04.08.2018 - BSEH has uploaded re-appear exam date for open candidates. The re-appear exam has been scheduled from 05.09.2018 to 20.09.2018. On 21.07.2018 - Haryana Open Exam will be held in the month of September 2018 for the compartment of old students. The exam date will be available in the last week of August 2018 or the first week of September 2018. On 07.07.2018 - Haryana Open Candidates will be given regular certificate. The link is provided in the end of the page. The case will be considered as CTP. 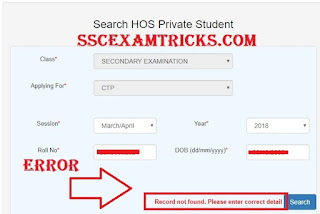 The good news is that Haryana Open STC Candidates (those who have already given Haryana Open exam in March 2018 and have re-appear or compartment) can fill their online form for re-appear or compartment on official website. The massage shows as "Record Not Found". It is rumor that Haryana Open website for Re-appear of 10th / 12th Class students may start working on or after 13th June 2018. The candidates who have re-appear in two or more subjects they can apply online for 10th /12th exam. There will be no change in the final DMC to be received after passing the re-appear examination. 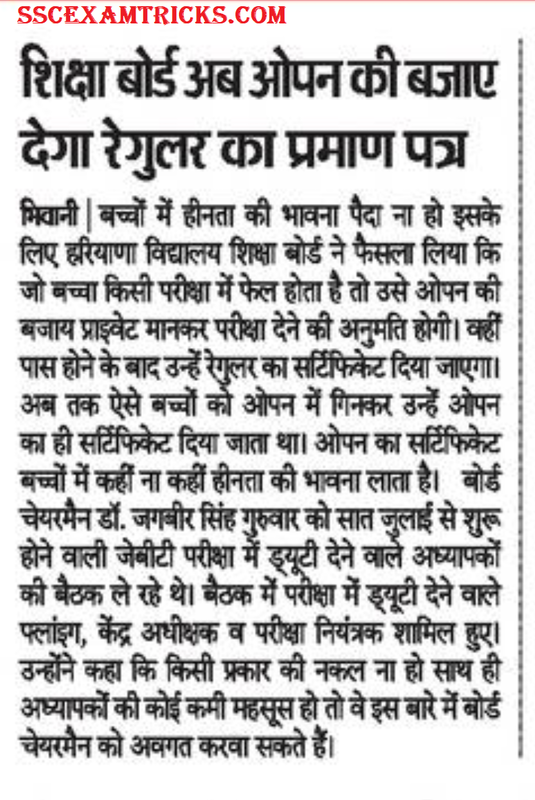 The same will be issued by Haryana Board of School Education. The difference is that No School name will be mentioned only "Direct Rohtak" may be mentioned at the place of School. Exact date of exam will be announce in the month of September 2018. The announcement of exam date will be published in the newspaper and the same will be uploaded on the website. Keep reading newspaper or visit official website. The bad news is that Haryana Open website for filling re-appear form for CTP/ STC is under technical problem. The website is not working in case you enter the correct details. The error produced as "RECORD NOT FOUND. 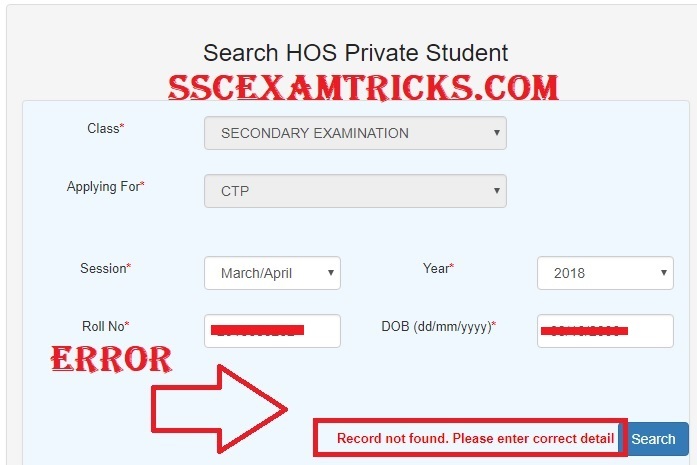 PLEASE ENTER CORRECT DETAILS", even the candidate is eligible for Haryana Open re-appear form 2018. Students are moving around to fill their online form for re-appear on the website. Don't panic. It may work well within 2-3 days. So keep calm and wait for the website repair. Keep in touch with us for getting latest updates. The link to apply online is given in the end of the page. On 23.05.2018 - Haryana Board 10th 12th Pass Percentage Record released Now. The subject wise pass percent of Haryana Board result for 10th & 12th Class has been released on official website www.bseh.gov.in. HOS 10th 12th Class result has been declared now on official website. The candidates are required to enter their roll number in the given column to know their result. The link to download result is provided here.